It had been over 30 years since my last visit to Sea Wold Orlando. I won’t wait another 30 before my next visit. I have two teenage boys so I was concerned that the park would not hold their attention. Never under estimate the powers of cute animals. There were many giggles and belly laughs from each of us. SeaWorld can easily be seen in a day. We were there in the heat of the summer months. I was happy that we used the Quick Queue Unlimited Access feature at the park. We were able to skip the regular lines as many times a we wanted to ride each of the seven attractions where Quick Queue was offered. On a hot crowded day the cost of this option is well worth the price. Prices start at $19 per person. There is even an option for premium show seating. Our fist stop was the Manta Ray. This roller coaster is fast and gives its guests a unique way of riding. Guests lay on their stomachs and take a wild ride through twists and turns. It should be on every thrill seekers touring plans. Restaurants and concessions are located through SeaWorld. We did not purchase the dining add-on. The park offers an All Day Dining Deal that allows guests to eat at select restaurants for one low price all day during your visit. We opted to eat at the Sharks Underwater Grill. Guests may make reservations online or by visiting the hostess stand at the restaurant. We did not have reservations but could be seated quickly if we agreed to eat in the bar area. There are several tables located in the bar area and guests could order from the main menu. The food was quite good and the air conditioning very refreshing. My only complaint was seeing the number of empty tables inside the main dining area. We had been told that the wait to eat in the main area was 2 hours. I’m not sure if there were no-shows for reservations or if they were short on wait staff. But it would have been nice to sit at a bigger table or booth and see the sealife behind the aquarium glass in the main dining room. The stars of this park are the animals! Don’t miss the shows. One Ocean performed in Shamu stadium was the highlight of the afternoon. The stadium is very large so finding a seat was not an issue. Just be prepared to get soaking wet if you sit in the Splash Zone. Meal times are the best times to see animals. Kids will enjoy the Touch Tanks located throughout the parks. Guests may purchase food to feed the stingrays and sea lions. 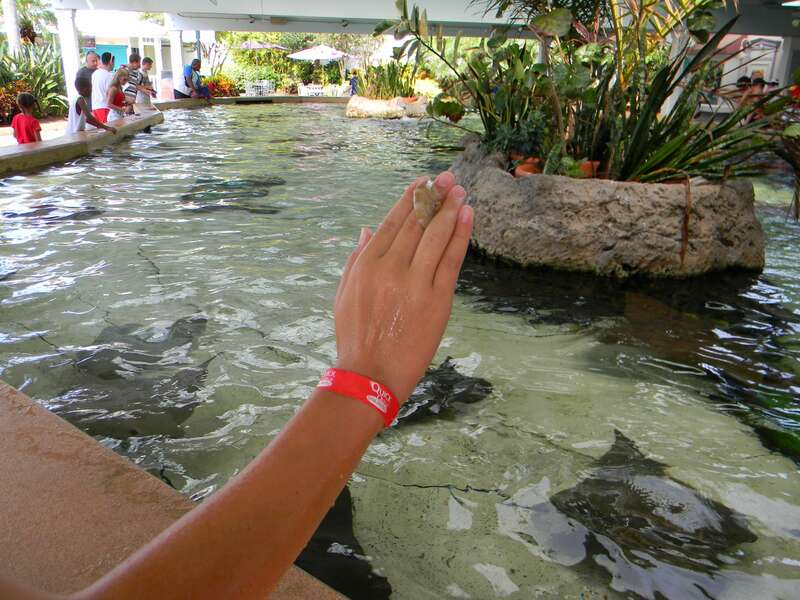 Stingrays are very docile and love to slurp up shrimp treats. The highlight of our trip was the Empire of the Penguin exhibit. It was frigid inside and on a very hot Florida afternoon that cold air was very welcoming. The line was quite long but we only waited 10 minutes with our Quick Queue pass. My family gave the visit high marks. It was a relaxing day to spend as a family. No rushing around and we even learned a few new animal facts. I would highly recommend this park for all ages. Hi! My name is Patricia Mickus and I live in Virginia with my husband and two sons. When we are on a family vacation we slow down and focus on having fun together. Making these magical memories together is more important than any gift my family could give me. Part of my job as a Vacation Concierge with Magical Memories Travel is to give my clients the opportunities to make unforgettable memories during their own family vacations together. Want to see more vacation tips. Visit my Blog, MagicalMickeyTips.com or my business Facebook Page. Previous Post Central Florida Fair to start this Thurday!!! Next Post Giveaway from Barnies Coffee Kitchen!! !